We Come To You, on DVD! People have traveled from Silicon Valley, New York, San Francisco, Toronto and even the Middle East to attend Gordon & Gordon workshops. But not everyone can afford the time and cost of traveling for training. So now industry veteran Manuel Gordon comes to you... in these ground-breaking "Workshop-on-a-DVD" packages that capture his day-long presentations on professionally-edited digital video. 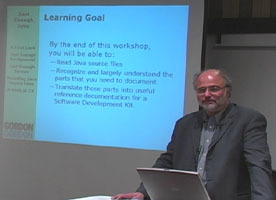 Now you can share in Manuel Gordon's inside knowledge of documenting APIs and SDKs and the Java programming language. Now you (and your whole team) can learn vital career-building skills... without ever leaving home! And remember, there's no risk: if you're not 100% satisfied with any of our products, you can return it to us for a complete refund.